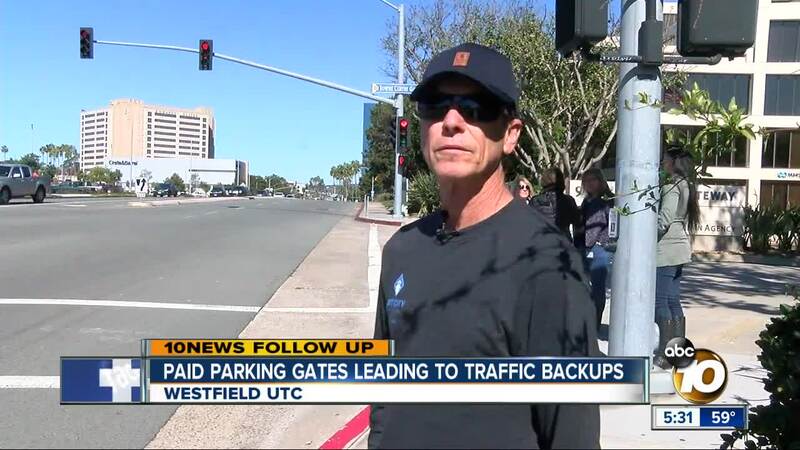 SAN DIEGO (KGTV) - Even when there is plenty of parking available at the Westfield UTC mall, the line to get in can still back up into the public intersection. That became apparent this week, after the mall began charging for parking, requiring cars to stop at gates to get tickets. On Wednesday evening and Thursday at lunchtime, traffic backed up onto Town Center Drive from an entrance on the eastern part of the mall. "It's awful slow going," said shopper Billy Pertle, who observed the traffic Thursday. "Wait 'til Thanksgiving, Christmas, the holidays. It's just going to be nuts." Westfield UTC began charging for parking on Jan. 30 to ensure only shoppers use its lots. In the past, it gave an example of UC San Diego students parking there all day for free and going to class as a reason for the change. The mall gives two hours free, and charges $2 for every additional hour to a daily maximum of $15. There are additional free hours for people who go to movies, 24 Hour Fitness, or ice skating. "I think it's going to hurt their business because it was a destination place where people could come and sit and chit chat, have coffee," Pirtle said. Westfield UTC declined to comment. Instead, a spokeswoman pointed to a handout that gives shoppers tips. It encouraged drivers to prepay at machines inside the mall, and noted it places staffers near the gates to assist. The recently expanded mall is the centerpiece of an area booming with construction - namely apartments and the trolley extension. Starting 9 p.m. Friday, crews will close the busy La Jolla Village Drive at Genesee Avenue for a week to essentially connect the tracks. The mall is also charging employees $5 a day to park. One worker who declined to give her name said many are upset because they work part-time and are low paid. Westfield UTC recently added a parking garage and also offers valet parking - it costs $8 for the first four hours, and then $2 per hour after - to a daily maximum of $20.